Is a Black Front Door For You? Everything does go with black, but does a black front door make you a little nervous? And just when should you paint your door black? Black can make a front door elegant and dramatic. It works well with any and every other color, making it extremely versatile. It can also toss a challenge your way. If you don’t have enough contrasting colors as a backdrop, black can hide the entry or make it feel too dark — not very good for your home’s curb appeal. 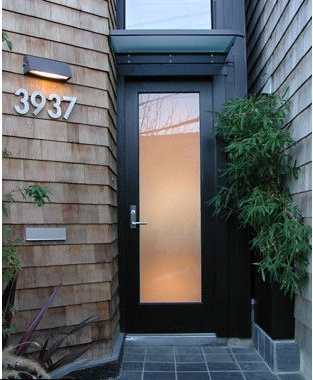 Read the full article about selecting black as your front door color via Houzz: http://www.houzz.com/ideabooks/4068875/list/Front-and-Center-Color–When-to-Paint-Your-Door-Black. Remember that Olde Century Colors paints are also perfect for exterior use. We feature a black paint in Acrylic Latex – Lamp Black and also a black paint in Simulated Milk paint – Carriage Black – both are perfect for fabulous front doors. For more information on Olde Century Colors Paints, visit our website www.Briwax-TRG.com. This entry was posted in Acrylic Latex Paint, Exterior Paint Colors, Front Doors, Olde Century Colors, Simulated Milk Paint. Bookmark the permalink. We have a newly designed website!